The backstory of author Leo C. Frisk, Jr is nearly as intriguing as the story itself. Frisk somewhat stumbled into becoming an author. Learning that he was going blind when his son was just 2 years old, he would make up stories for his son, Joseph, with a book in his hand, pretending to read the words on the page. What he was actually doing was something more incredible. Joseph loved the stories his father was creating and they would be repeated over and over until Joseph was finishing lives his father forgot. This paints an endearing image of father son bonding in my head, and it led Frisk to learn that he has a talent for writing children’s books. A Cricket’s Trick or Treat is a Halloween story. 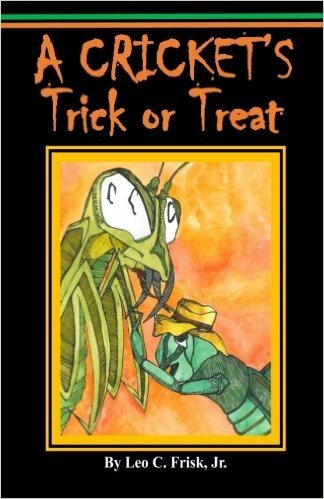 Taking place on a front lawn on Halloween night, a variety of insects, including grasshoppers, ants, spiders, crickets and a slug, gather to hear a concert performed by Song Maker, the most musically gifted cricket anyone has ever met. They all gathered and waited patiently for the music to start. Their patience was rewarded with a rousing concert, interrupted by the feared praying mantis. From there, a kidnapping ensues and Big Daddy (spider), Long Green (cricket), Father Ant (ant) and Slimy the Slug go off on an adventure to retrieve Mother Ant. It takes some good planning, teamwork and a little bit of luck for these four friends to find Mother Ant, but they eventually get there, though not before a trick that precedes the happy ending. This story makes for something nice to read to children before bed. This can be a blast for anyone who really gets into the story and uses a different voice for each character (Frisk describes the characters in a way that puts their voice in my head). At over 40 pages, this could definitely serve as an “I’m only reading one book before bedtime” kind of story, but it flows well, has interesting characters and a silly ending that should end the night on a positive note. While not exactly a picture book, there are a few black and white (except for the front and back cover) pictures drawn by North Providence native Marcy Feeney. For the most part, these are simple drawings of the insects, but they add a lot to the story. Feeney does a great job with the facial expressions of the insects, really nailing the emotions they are going through at the time. Though this is a Halloween tale, it could be read at any time of year. Take a few key words out here and there and it’s a story about a community gathering, overcoming fears and odds and, most importantly, the value of friendship and helping out those you care about. There are many valuable lessons, a bit of goofiness and a dose of fun that will make for some special pre-bedtime bonding with your kids, which may have been Frisk’s goal all along.